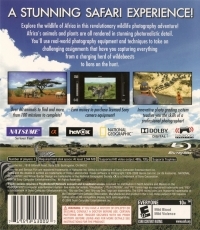 Box Text: A STUNNING SAFARI EXPERIENCE! Explore the wildlife of Africa in this revolutionary wildlife photography adventure! Africa's animals and plants are all rendered in stunning photorealistic detail. You'll use real-world photography equipment and techniques to take on challenging assignments that have you capturing everything from a charging herd of wildebeests to lions on the hunt. • Over 60 animals to find and more than 100 missions to complete! • Earn money to purchase licensed Sony camera equipment! • Innovative photo system teaches you the skills of a professional photographer! 02-26-2018 price5474 Box Text A STUNNING SAFARI EXPERIENCE! Explore the wildlife of Africa in this revolutionary wildlife photography adventure! Africa's animals and plants are all rendered in stunning photorealistic detail. You'll use real-world photography equipment and techniques to take on challenging assignments that have you capturing everything from a charging herd of wildebeests to lions on the hunt. • Over 60 animals to find and more than 100 missions to complete! • Earn money to purchase licensed Sony camera equipment! • Innovative photo system teaches you the skills of a professional photographer! 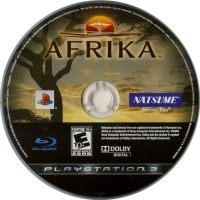 This is a list of VGCollect users who have Afrika in their Collection. 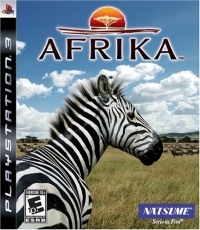 This is a list of VGCollect users who have Afrika in their Sell List. This is a list of VGCollect users who have Afrika in their Wish List.